Amazon’s line of Kindle devices has evolved from simple e-readers to high-powered tablets, making them the perfect gift. The Kindle line has something for everyone on your list, from your boss to your kids, it’s just a matter of choosing the right Kindle for the right person. Each model has different features and options, so you need to know who your buying for and what they’ll be using it for in order to make the best selection. Most importantly, you’ll need to know the features and benefits of each Kindle, but don’t worry, we can help you with that. Our Ultimate Kindle Buying Guide and Comparison Chart 2015 will teach you all about the Kindle’s history and give you a comprehensive breakdown of each model to help you find the perfect gift for your family and loved ones. Consumers love the Kindle lines because they are high-tech, high quality and can fit anyone’s lifestyle. They are the only eReader and tablet hybrids on the market, making them a one-of-a-kind gift. Other tablets let you download and read books, but they don’t posses the glare screen or special features like page turning without moving a finger and more. Plus, even though the eReader is a key selling point the newer models have incredible graphics, resolution and unique features like X-ray, which lets you see information on actors, authors and more when reading or watching a movie. As if all that wasn’t enough, with a Kindle you get premium access to Amazon’s vast music, TV, movie and book libraries, giving you an endless amount of material to enjoy. • Features: features play a role in pricing, so know what each model offers, so you’re not paying for things you don’t need. For example, if you are buying for an aunt or co-worker who like to know author information or discuss books you’ll want a Voyage, not a regular Kindle. • Compatibility: make sure the model you choose compliments the person your buying for. Don’t buy what you like, but what they need. If your giftee is a game lover you’ll want a Kindle that has improved graphics and networking, like a Fire HD. The first Kindle to hit the markets was the first generation Kindle device in November of 2007 and it was a product truly ahead of it’s time. It was designed to be an e-book reader only, with basic Internet access and to many in the industry it was seen as an unlikely success. The idea of reading books on an electronics device seemed way out there, so imagine everyone’s surprise when that first Kindle device sold out in just 5 1/2 hours of hitting stores. The device was an instant sensation thanks to it’s remarkable glare free, grey-scale e-ink screen that made it look like you were reading a newspaper, minus the paper. Consumers everywhere began snatching them up and raving over it’s many impressive features, prompting Amazon to eventually expand their line, takig the successful components of the eReader and integrating them into a tablet. This resulted in 2 lines of products: the Kindles multi-generations eReader line and the Kindle Fire tablets line, which first hit stores in September of 2011. 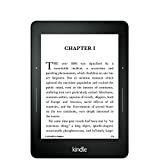 The Kindle e-Reader line consists of improved versions of the original Kindle. This line includes the 2nd to 5th generation Kindles, each with improved capabilities like bigger screens, faster processors and slimmer designs. These models are joined by the 6th generation, which featured the Kindle Paperwhite (1st & 2nd Generation). The Paperwhite (2012) is known for it’s built-in LED lights that can be adjusted for the exact amount of light you need and full touchscreen operations. Finally there is also a 7th generation, which features the Kindle 6 (2014) and The Voyage (2014). The Voyage is know for it’s 300 ppi resolution (the highest resolution you can find in an eReader as of this writing) and PagePress capabilities, allowing you to turn a page without moving your hands thanks to embedded sensors. 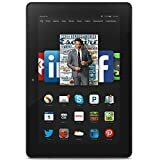 The Kindle Fire Tablet line, which debuted in 2011 with the original Kindle Fire, was just as popular with consumers, as the Fire contained everything they loved about the eReaders and put it in a tablet. Now, consumers had the best of both worlds as they could go on social media , watch movies and read their favorite books all on one device. The Kindle Fire was soon followed by the Fire HD (2012) and the Fire HDX (2013). These newer tablets had increased processing (up to 2.5 Ghz), screen sizes and impressive features like the “Mayday” button, giving 24-hour online tech support. 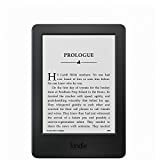 This is considered the Best Kindle eReader and with good reason: it is the newest eReader and with improved 300 ppi resolution it truly feels like your reading the newspaper. Moderately priced at $199, it is packed with everything book lovers need to have the ultimate reading experience, starting with a sleek, lightweight design and an adaptive front light so you always see perfectly, day or night. There’s PagePress, which lets you turn pages by simply pressing down on a button on the side of the Kindle and Time To Read, which monitors how long it takes you to read each chapter in a book. There are also fun new features like family library, which links your device to your spouse, child, etc so you can share libraries. The perfect gift for anyone who wants a heightened reading experience that goes beyond what’s on the page. This high-quality eReader beats any tablet when it comes to downloading and reading books, magazines and more. Reasonably priced at $119 it makes the perfect present for those looking for a reading device and nothing more. It is over 30% lighter than the iPad, so you can hold it in one hand and has a battery that can last for weeks. It has the famous grey-scale screen and a built-in, adjustable light so you’ll never strain your eyes, no mater where you are. This is a true eReader and is great for the purists who want to read with no interruptions or distractions. This is the lowest priced Kindle at just $79,but it is packed with lots of great features, including a convenient touchscreen display. This Kindle is perfect to get older kids and pre-teens excited about reading thanks to a 20% faster processor and storage capacity that can hold thousands of more books than the other models. It comes with lots of great features including FreeTime and giving them access to thousands of titles that are priced under $5. Plus, it has WordWise to expand their vocabulary, GoodReads to connect with other readers and talk about books and About This Book, giving you a preview of what the book is about before you buy it. It fits in your pocket, so kids can carry it while traveling to school or a friends house, making it the perfect gift for the burgeoning little book lover in your life. I’d call them the Color eReaders and Tablets. Not only you can read, also you can watch videos, browse the web, and run Android based Apps and Games. This eReader tablet makes a great gift for anyone who wants to read, surf the internet and more thanks to it’s dual capabilities. Reasonably priced at $179, the Fire has the exclusive HDX enhanced 7″ display for crystal clear viewing. It has a super-fast 2.2 Ghz processor so you can download and store thousands of books, movies and music without slowing down the system. This model also has the “Mayday” button, giving you 24-hours a day, 7 days-a-week live technical support from Amazon, right through the device. It also has the Xray feature, so you can see song lyrics, movie information and more, giving you the most well-rounded entertainment experience ever. Plus, the Amazon app Store gives you a paid app for free- 1 a day, every day. The ideal present for anyone who enjoys all forms of entertainment, from movie buffs to video gamers. This powerful Fire tablet was designed for families, as it fits the needs of both teens and parents and costs $119. It has a 1.5 Ghz processor and a 7″ HD display, so everything looks sharp and bright. This model comes with unlimited cloud storage, so kids can download all their favorite songs and adults can have a full movie library at their fingertips. There are over 33 million titles to choose form in every category, so everyone can see, read and hear what they want. Parents can also set up time restrains and limit what kids have access to, making the internet a safer place. Plus, school kids can view school papers and even edit them thanks to the Office documents app. A great tablet for teens and parents, giving each what they want and need. This is the slightly smaller version of the Fire tablet and it’s also more affordable at $99, making it the best value for your dollar. The smaller screen still boasts picture-perfect HD dsiplay and a strong 1.5 Ghz processor, making it the perfect tablet for games and socializing. There is also front and rear cameras to capture all your favorite moments With all the same features as the 7″ tablet plus Gorilla Glass, which makes it extremely durable, this little tablet delivers on all fronts. It’ compact size makes it a dream come true for commuters and travelers. Specially designed for young kids this tablet costs just $119 and is perfect to teach and entertain your little ones. It’ designed for kids but it still has a 6″ HD display and quad processor so kids can read and watch cartoons seamlessly. It comes with a kid-proof case in an assortment of colors, so you don’t have to worry every time they drop it. Thanks to Amazon’s 2-year no worry guarantee if it does break for some reason just send it back and they’ll replace it, no explanations needed. Parents will also love that it comes with 1-year of unlimited Amazon FreeTime so kids have access to over 5,000 books, shows and more. All this and the best in built-in parental controls make this the perfect choice for the younger generation. This is by far the Best Fire Tablet due to all it’s enhanced features and is the perfect gift for the special people in your life and well worth the $379 price tag. The 8.9″ HDX display makes you feel like your watching on a PC or laptop thanks to it’s larger size and delivers incredible, life-like images. It boasts a 2.5 Ghz processor and weighs less than a pound, for the sleekest design yet that can handle all your personal and professional needs. In addition to the “Mayday” button this model also has FireFly technology, which can recognize and tell you artist information on over 24,000 different TV shows, movies and music. There is also the fling features, so you can take what your watching or playing and “fling” it onto the TV, for uninterrupted viewing you can share. All of this, plus Office Suite to handle your business needs this tablet is the ultimate gift for the ultimate recipient. As you can see there is a Kindle model for everyone. 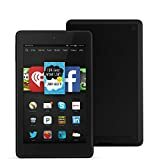 Consumers love this line of Kindle eReader & tablet because they are the best in quality and design, making them superior to all their competitors. They make the perfect gift because they are not only well priced but also made to improve the life of anyone who owns one. So take our Super Kindle Comparison Chart and Buying Guide with you on your next shopping trip to you can pick out a special Kindle for that special someone. Happy Shopping!